Gentrification refers to the process of capitalist “redevelopment” of neighbourhoods and cities. When a neighbourhood is gentrifying you might see new fancy restaurants replace the cheap-eats that stood before, or you might see shiny new condo buildings replace affordable apartments and social housing. Many of Montreal’s neighbourhoods are gentrifying. Some areas are far along in the process, and others are just beginning to accelerate. Here’s our primer on a few of the neighbourhoods where gentrification is happening, has happened, and is being resisted. In August, residents of Parc-Extension tried to deliver a letter of their grievances to BSR Group, a development company which had recently taken hold of a historic building in the neighbourhood. The company managed by Ron Basal had begun evicting tenants as part of their plan to build luxury apartments. The building in question is Plaza Hutchison, and it’s been the most explosive flashpoint in a broad community-led struggle against gentrification in Parc-Ex. Over the years, the building has housed social services, language schools, faith centres, local businesses and community organizations. If the BSR group has its way, those days will soon come to an end. A historically working-class neighbourhood, Parc-Ex has always been a migrant community. Housing Eastern Europeans and Jewish people displaced by the Second World War in the 1950s, followed by a wave of Greek migrants, it became home to a large South Asian community in the decades that followed. That community’s presence in the neighbourhood remains felt through the restaurants and grocers that line Jean Talon Blvd. Haitians, Latinos, and Africans call the neighbourhood home. Locals attest to longstanding networks of mutual aid and community support operating in the neighbourhood. It’s also one of the lowest-income neighbourhoods in the country, with the highest percentage of working-poor residents in the city, according to a joint study by Centraide of Greater Montreal and the Institut national de la recherche scientifique. At the northern limits of the neighbourhood, Parc-Ex is bordered with a fence that separates it from the Town of Mount Royal, one of the richest neighbourhoods in the city. To the south, Parc-Ex is bordered by the Mile End, a neighbourhood known as a haven for hipsters and artists, having earned itself that reputation after rent in the Plateau rose too high and pushed them farther north. The same process is now repeating in Parc-Ex, as young people search for affordable housing. The “influx of mostly white students, artists and hipsters into Parc-Extension,” has started to change the neighbourhood, Darwish said. “Things such as postering heavily for Pop Montreal shows, the construction of spaces like Bar Le Ritz, or the new Le Virage space have contributed to making the neighbourhood feel more comfortable for other artists to settle in,” she said. Darwish said the cultural capital they bring with them—making the neighbourhood cool and artsy—makes it attractive to real-estate developers like BSR Group, who use the neighbourhood’s coolness to sell condos to rich young professionals. But it’s not just hipsters trickling into the neighbourhood. There’s another trigger for Parc-Ex’s gentrification, and it’s having a much more rapid effect—Université de Montréal is building a new campus in the neighbourhood by Acadie metro. The campus is expected to draw 10,000 students to Parc-Ex. The university itself is also building about 1,300 housing units for students. Neighbourhoods with high proportions of students tend to see more pronounced rent increases over time, since students tend to settle for a short period and landlords use that as an opportunity to hike the price of rent. According to Quebec law, renters are allowed to see what the previous tenant paid in rent and are also allowed to refuse rent increases–though young people don’t always know to ask. Darwish said she and other neighbourhood organizers are hearing stories about “renovictions” happening more frequently—referring to when landlords use the excuse of “major renovations” to evict tenants. Major renovations are one of the only ways that landlords can evict rent-paying tenants under Quebec law, and Darwish said that many of the renovations involve converting family homes into small apartments for students. The rapid gentrification across the neighbourhood helps explain why Plaza Hutchison has become such a potent symbol for residents. As the first building that is seen by anyone leaving Parc metro station, it serves as a gateway to the broader community. When the evictions in Hutchison began in November 2017, residents began holding neighbourhood assemblies. They held rallies, attended (and disrupted) city council meetings where the BSR Group applied for permits and showed up to the BSR Group’s offices in Côte-des-Neiges. Their most recent action saw the highest level of aggression yet from BSR employees. Saint-Henri, considered to be a ‘cultural capital,’ has long been presented with a battle of epic proportions—gentrification. The history of Saint-Henri goes back a long time. It has deep roots in the working class community and striving for better socio-economic conditions for all. From the late 1870s to the late 1920s working conditions in Saint-Henri were poor. People of all ages worked to be paid next to nothing, which led to battles for fair working conditions, unions, and the creation of daycares and non-profit organizations. Within this time period, Saint-Henri became an official part of Montreal and became increasingly urbanized, meaning they received necessities like a water supply system, law enforcement, and other public utilities. However, among all this good came some negative results. 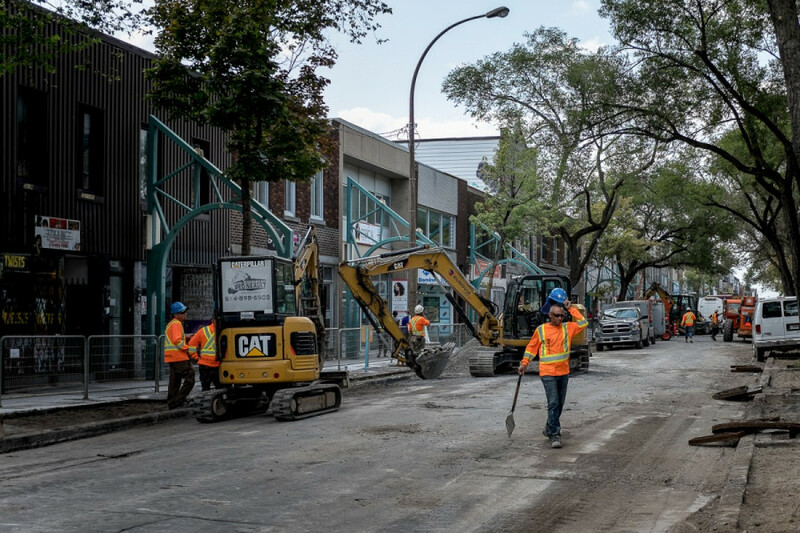 “The Southwest Borough (St-Henri, Little Burgundy, Pointe-Saint-Charles, Côte-St-Paul, and Ville-Émard) has made some small steps towards contributing to the construction of social housing in recent years, but the real power to do so lies with the city centre,” said Fred Burrill, an expert on gentrification and the history of Saint-Henri. Burrill explained that after the urbanization of Saint-Henri, its appeal and population grew and resulted in bad housing conditions. Middle and upper class citizens could afford to have custom built houses while working class citizens dwelled in overcrowded buildings. “There used to be a municipal program dedicated to the construction of low income housing, but essentially since the late 1990s the city has washed its hands of development, leaving it up to the private market. While there is a much larger percentage of social housing in Saint-Henri than in most other neighbourhoods in Montreal, that’s principally due to a robust history of tenant mobilization,” Burrill said. When we talk about gentrification we talk about people’s livelihoods. Those who live in Saint-Henri cannot be overlooked. Donna Knorren, who has lived in Saint-Henri since 1997, says that she remembers feeling as though the neighbourhood could have used some “revitalization but not gentrification.” During that time, Knorren recalls the area having a lot of middle to low class residents, but that grocery stores and other essential stores were overpriced. This is not unlike the current conditions of Saint-Henri. “Contrary to what some would have us believe, the rising tide is only raising up a few boats, and everyone else is capsizing,” she said. Knorren felt as though the city could have done more for lower income individuals and families as there was no community involvement, and not a lot of options for people to help maintain a standard of living. Gentrification is a process that affects marginalized communities disproportionately. People of colour will be and have been affected differently by gentrification. One example would be Little-Burgundy to the east, historically a predominantly Black community which was redeveloped by the city in the 1960s, causing a displacement of the local population. In 2011, only 18 per cent of Little Burgundy was Black. 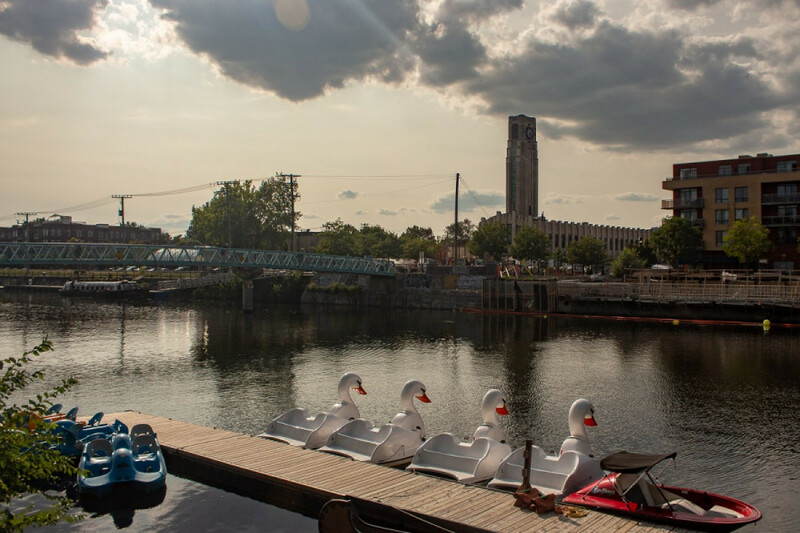 To the south of Saint-Henri is the quieter, less commercial Pointe-Saint-Charles, another neighbourhood that is experiencing a gentrification process since the reopening of the Lachine Canal in 2002 brought a renewed interest in the area. When you cross the Canal from Saint-Henri to the Point, the stark contrast between the two areas might lead you to believe otherwise.“The Point is, I find, more resistant to the effects of gentrification than other neighbourhoods,” said Patrick de Gruyter, project coordinator at the Saint Columba House community centre in the area. 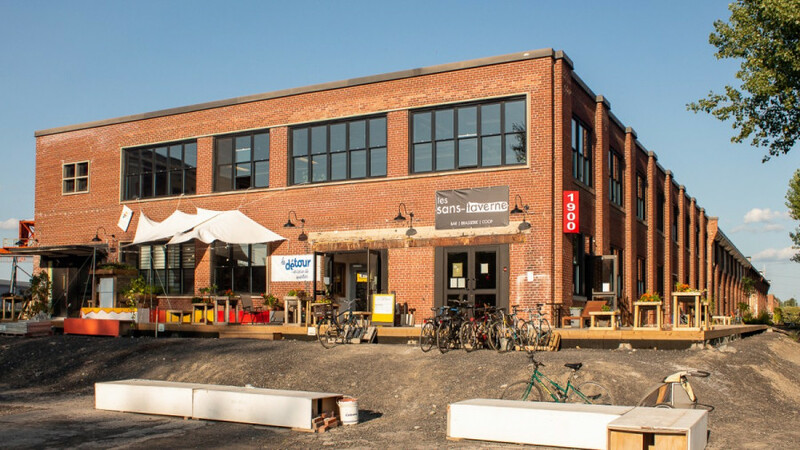 Pointe-Saint-Charles is indeed a far cry from Saint-Henri, but for the longtime residents of the area, the rapid social change to the area is undeniable. A housing project is being built next to the Saint Columba House and is expected to open this September. It is just one of several projects in recent years in the area. This particular project is smaller scale with only four units, so it is not obligated by law to make a portion of its units affordable housing. The relatively new surge in condo developments has become a sort of running joke for residents in the area. Back in February when two low-cost apartment buildings were evacuated with three weeks notice due to bad conditions, rumours that the evictions were done to make room for condos were abundant. Pointe-Saint-Charles, similar to Saint-Henri, began as a settling ground for workers and migrants in the mid to late 1800s. It was a convenient location for Irish settlers fleeing famine, as many had been hired to build The Grand Trunk Railway and the Victoria Bridge. In the years leading up to the 1950s other workers settled in the area to work in the factories along the Canal, which marks the Northern border of Pointe-Saint-Charles. But after railroads were constructed and St. Lawrence Seaway opened in 1959 the Lachine Canal became obsolete and jobs in the area became scarce. Community mobilization is a common theme in Pointe-Saint-Charles history. Longtime locals can recall protests from calling for slower speeding limits to keeping the local community-run clinic from being absorbed into the public system, even to denouncing the closure of the neighbourhood’s only liquor store on one more lighthearted occasion. A local of over 50 years, Donna, who gave her first name only, described how the community got together when Loto-Québec showed interest in building a casino in the Point in 2005. The project was finally scrapped, thanks in large part to the efforts of the community. The building that stands in what was going to be the location of the casino reopened in May as a community centre designed to meet the changing needs of residents. Bâtiment 7, a project over a decade in the making, is a collection of various initiatives ranging from a youth co-op arcade to artist workshops to a grocery store. “The priority was always to meet the needs of the community,” said Kevin McMahon, responsible for the financial administration for the Collectif 7 à Nous, who own the building. McMahon explained that Bâtiment 7 will open two more phases that will address other community needs, with phase two focusing on health and family projects set to open in 2020. When asked what they would like to see from newcomers in the area, a few longtime locals expressed a mutual wish: they would like new residents to adopt the age old Pointe-Saint-Charles tradition of greeting each other on the street.